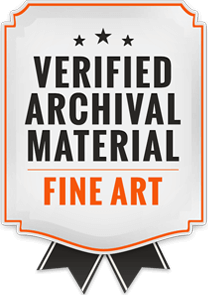 The creative materials used in all original artwork are museum archival quality with UV varnish or UV resin coating. Metal leaf can tarnish over time which brings a unique patina aspect to the paintings. The metal leaf elements are sealed however, I cannot guarantee there will be no discoloration depending on the environment they are stored.